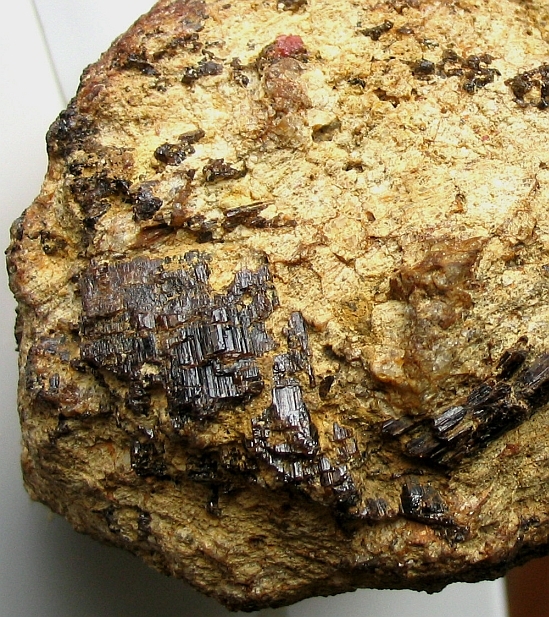 Painite was once considered one of the rarest minerals on earth. The first painite to be recognized as new mineral (painite #1) was a sample discovered in Burma in the early 1950's. For many years only two crystals of this hexagonal mineral were known to exist. Its chemical formula is ideally: CaZrBAl9O18. 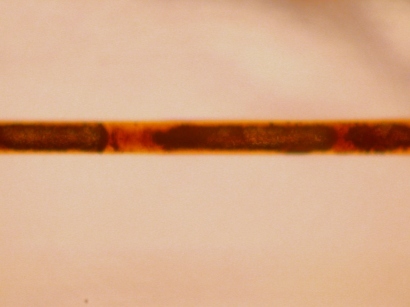 However, it also contains minor amounts of chromium and vanadium that contribute to the orange-red to brownish-red color of the mineral plus traces of iron. In addition to zirconium, minor amounts of titanium and hafnium also are part of its composition. 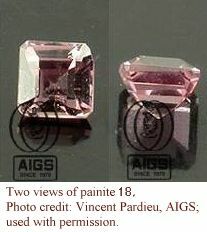 While it often appeared in lists of gemstones, only two faceted gemstones had been reported prior to mid-2005. 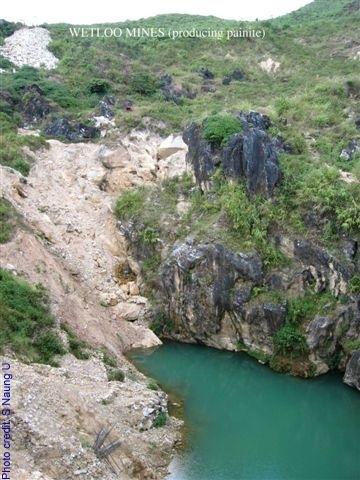 The discovery of a new locality in northern Myanmar in 2002, and the discovery of major new localities in the Mogok area led to the recovery of several thousand crystals and fragments. Nearly complete crystals remain few in number and high quality facet material remains rare, although several hundred crystals and pieces have been faceted to date. GRR 417 spectrum; This spectrum was taken from a slice of crystal #1 (British Museum 1954,192) that was used for the original structure determination (Moore and Araki, 1976). 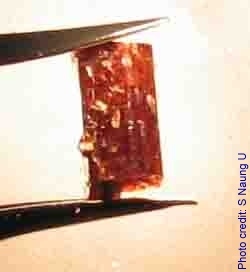 It was found in the gemstone fields near Ongaing, a village near Mogok, Burma, by A.C.D. Pain. Plotted for 0.60 mm thickness. Data Files: E perp c 18K; E||c 15K. Painite #1 is a 1.7 gram crystal that resides in the British Museum of Natural History, London (BM 1954,192). It was obtained in 1952 through a donation by A.C.D. Pain, and originally described in an article by Claringbull et al in 1957. 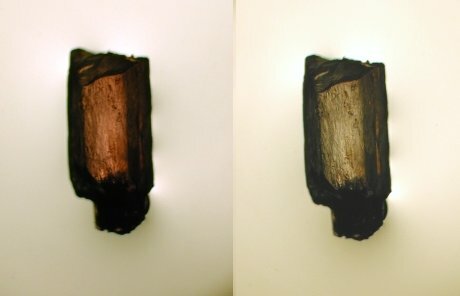 The slice of this crystal (painite #1b) that was used for the X-ray structure determination (Moore & Araki, 1976) and the optical (Shigley et al., 1986) and Raman spectra is now at the California Institute of Technology. 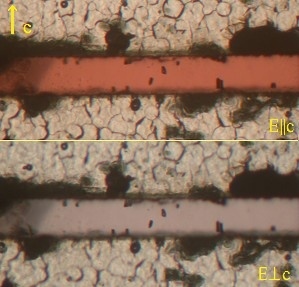 The dichroism of a 0.606 mm thick slice of painite #1b embedded in beads of a colorless plastic shows that the crystal is orange-red for light polarized parallel to the c-axis and pale purple when polarized perpendicular to the c-axis. Painite #2 is a dark, 2.118 gram crystal on public display in the British Museum of Natural History, London. There are no reported detailed studies of this crystal. Painite #3 is a 0.27 gram crystal now in the collection of the Gemological Institute of America. It was discovered in 1979 at the Gemological Institute of America (GIA) in a parcel of gemstone rough and has been extensively studied at the GIA, at the Los Angeles County Museum of Natural History, and at Caltech (Shigley et al., 1986). 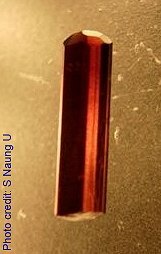 It is a dichroic, deeply colored, brownish-orange red crystal with a density of 4.03. Painite #4 [updated May 2006] was originally ~11 grams (55 cts) when discovered in late summer, 2001, in Burma. 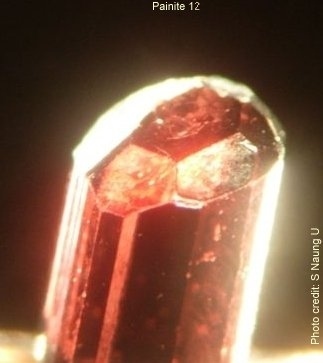 The identity of painite #4 was first suspected by Burmese investigators based on its density, refractive indices and hardness. 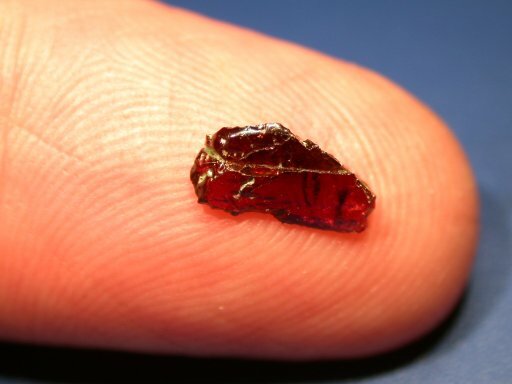 A 0.188 gram slice (painite 4b) was removed from it and was sent to Caltech for confirmation of the original tentative identification where its identity was confirmed in September, 2001. The XRF analysis showed major Al, Ca, and Zr, and minor Ti, Fe, Hf, and Cr. The Raman spectrum matched the standard painite spectrum that we acquired from the sample of painite #1b that was originally used to determine the crystal structure (Moore & Araki, 1976). Even though the orientation of crystal #4b is different, its infrared reflectance spectrum is similar to that of painite #1b [in the (0001) orientation]. Slice 4b is now privately owned in the USA. A small aliquot of 4b also resides at Caltech. A second slab that was also removed (painite 4c) is in the US National Museum of Natural History, Smithsonian Institution. 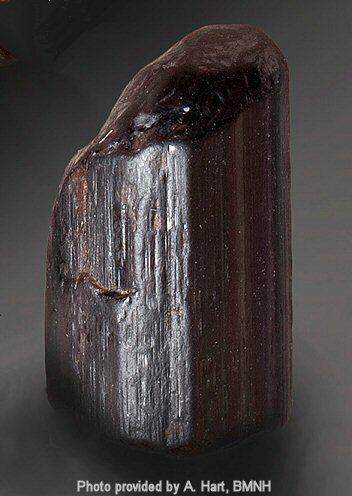 The main mass (painite 4a, now 54 cts) of the dark, nearly opaque crystal was originally privately owned in Burma. 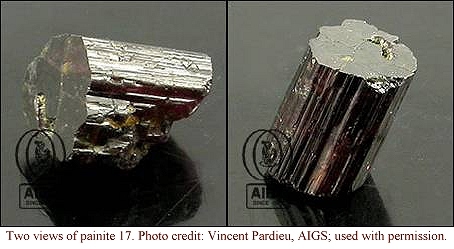 Painite 4a was subsequently acquired by the GRS Gemresearch Swisslab AG, Switzerland. It has been the object of detailed study at the AIGS laboratory in Bangkok, the GRS Swiss lab, and university labs in Switzerland. 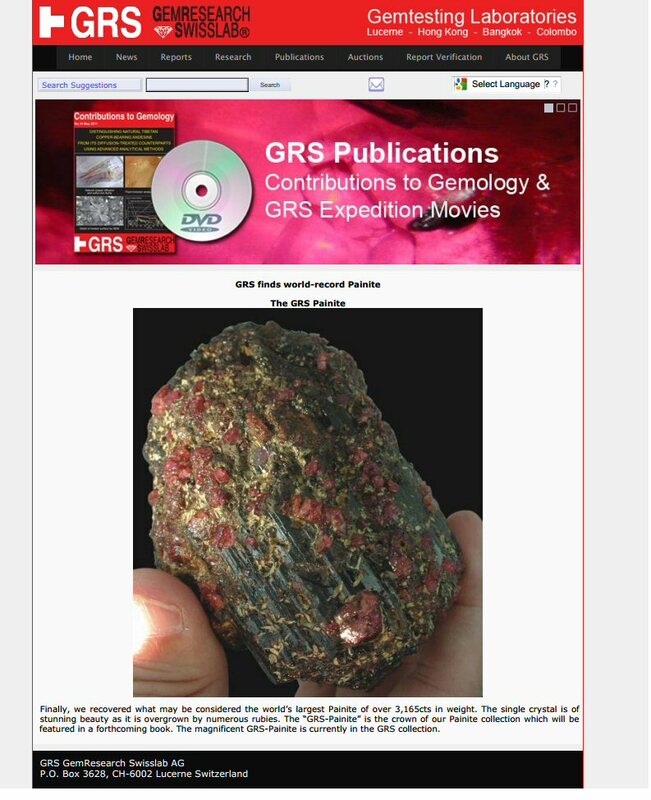 A 0.030 gram fragment (painite 4d) was removed from the main crystal and appears at the website of the GRS Gem Research Swiss Lab. Detailed chemical analyses and a redetermination of the crystal structure are reported by Armbruster et al. (2004). 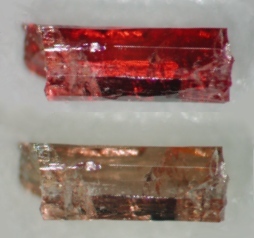 Unaware that their crystal was identical with crystal #4, Armbruster et al. 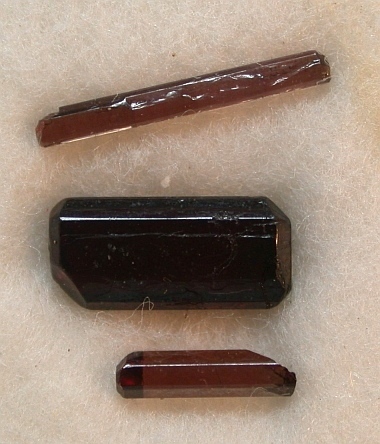 stated that the 54 ct crystal came from a new crystal which they labeled painite #6. 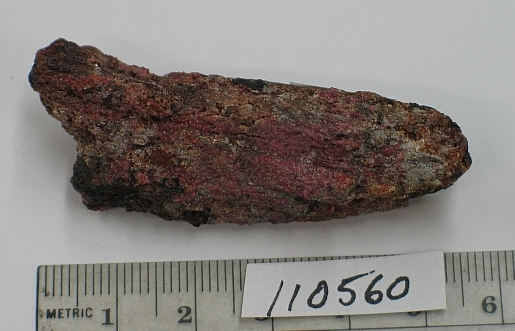 Painite #6 was purchased by the author of this web site in Namya (Nanyarseik), northern Myanmar, in March, 2002, and identified from its chemical composition and Raman spectrum. 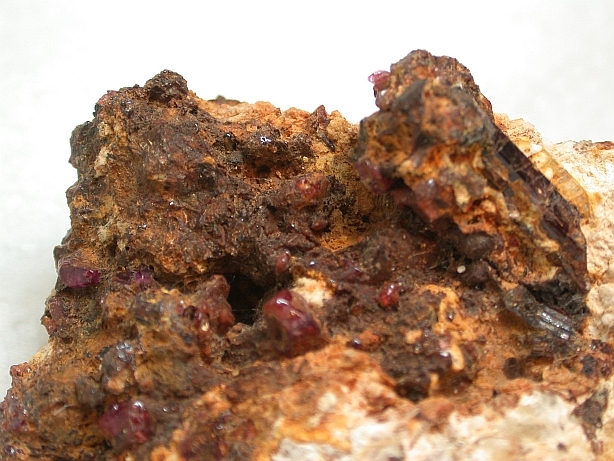 This locality is a ruby mine far removed from the original discovery locality at Ongaing and represents the second known locality where this phase occurs. The crystal has undergone detailed study at Caltech. 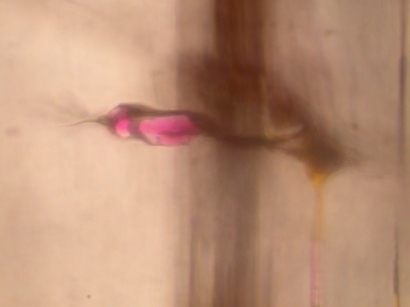 It was originally identified from its X-ray fluorescence spectrum while embedded in plastic with corundums in a mount prepared for analysis in a scanning electron microscope (image to the right). 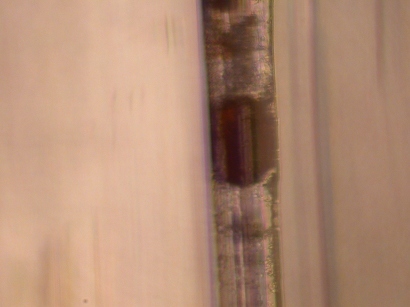 It is currently embedded in a plastic mount that was used for electron microprobe analysis. This allows the internal detail to be seen. When the mount is tilted so the line of sight is down the long axis, the symmetrical pattern of the internal features can be seen. 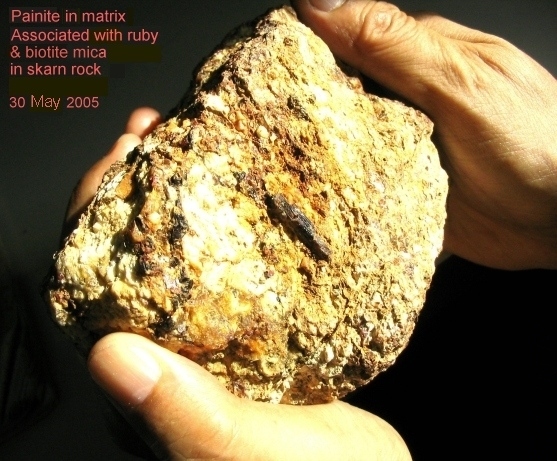 Painite #7 was also purchased by the author of this web site in Namya, northern Myanmar, in March, 2002, and positively identified based on its chemical composition and Raman spectrum. 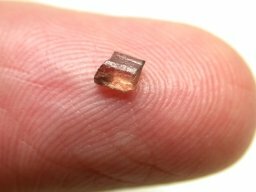 This 0.0467 gram, dichroic pale pink crystal is currently at Caltech for detailed study of its composition and optical spectrum. 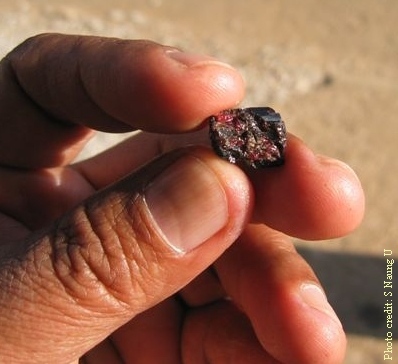 This crystal, and all other others discovered to date from the Namya localilty, are much paler than painite crystals found at Ongaing and other localities in the vicinity of Mogok. 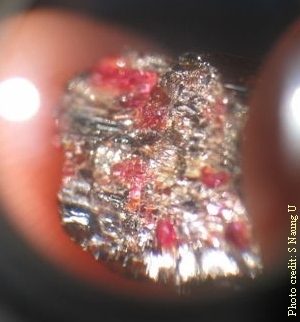 Painite #9 was offered for sale in 2004 in Yangon, after which it went into private ownership in Japan. 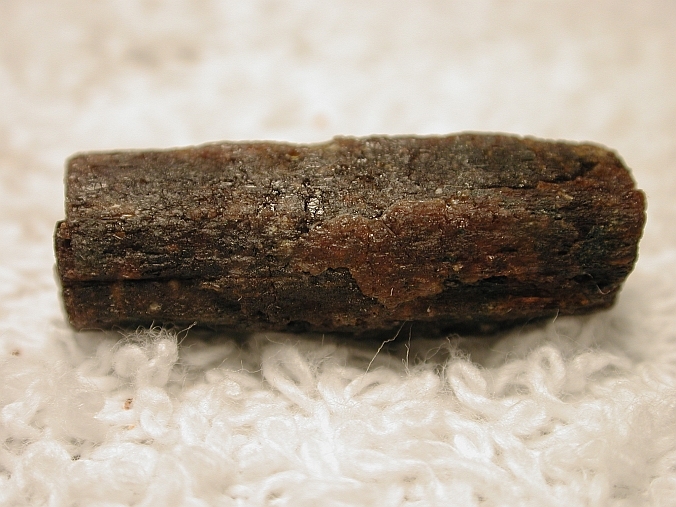 It reportedly weighs about 340 mg and is an orange-red color similar to painite #8. It is now in the collection of the GRS in Switzerland. (updated 26-May-2006). Painite #10, a dark, brownish-orange uniaxial crystal was found in December, 2004, near Ohngaing village, Mogok region, Myanmar. 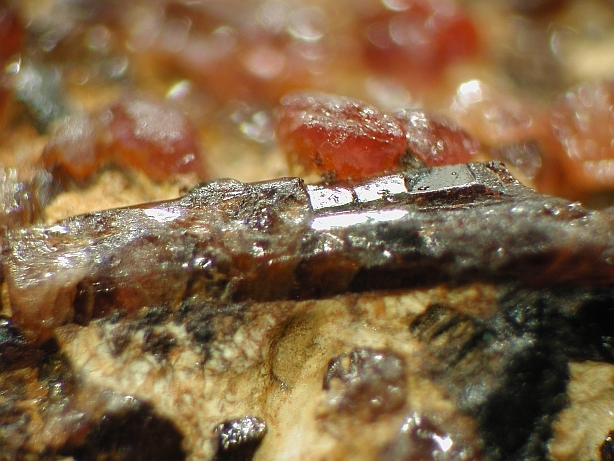 It was identified as painite in Mogok on the basis of standard gemological testing. 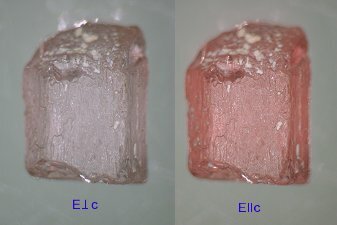 It is strongly dichroic from brown to red. 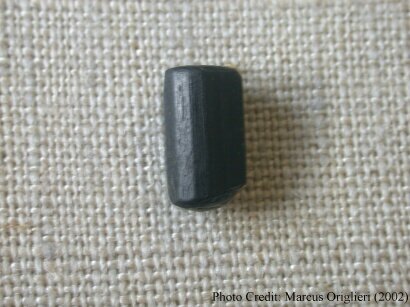 The 0.93 gram stone was orginally studied by a Burmese gemologist and is now in the collection of the GRS in Switzerland. (updated 26-May-2006). Painite #12 is an orange-brown, 0.156 gram, transparent, uniaxial, gemmy crystal with one perfect termination was obtained in Burma in 1992. It is currently under private ownership in Burma but its existance was only recently made public. 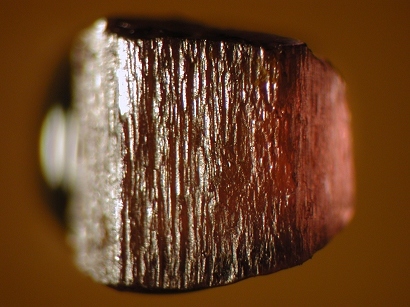 As such, it may be the fourth painite crystal actually discovered. Painite #13 is an orange-brown, 0.264 gram, transparent, dichroic, gemmy crystal identified January 4, 2005, by a gemologist in Mogok. 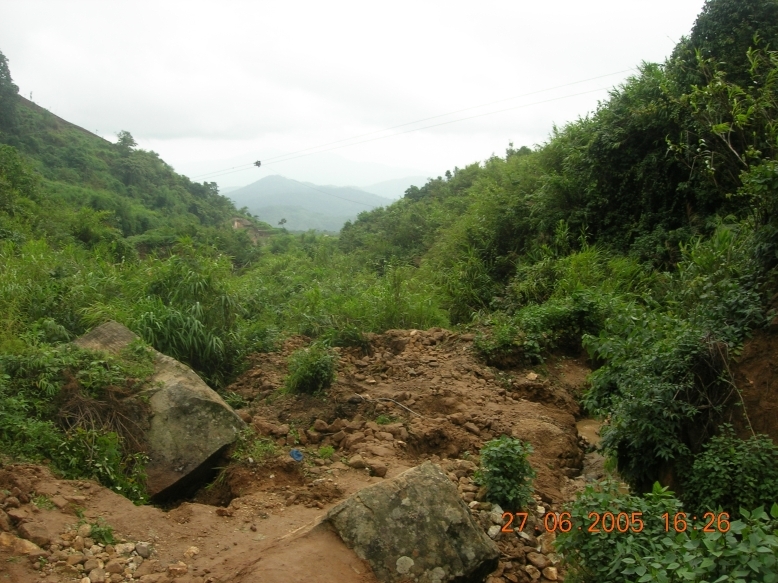 It was found near Mogok, Burma, and is currently under private ownership. It was offered for sale (April, 2005) partly through advertisements on the web. 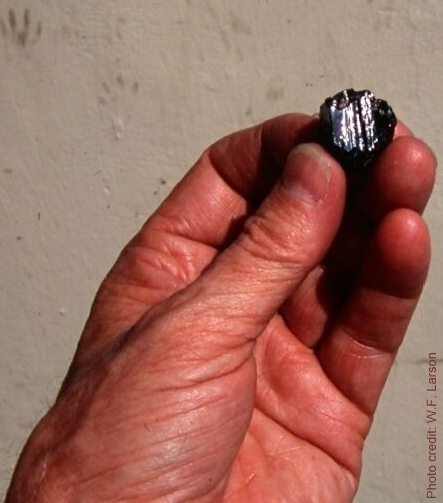 News about our discovery and identification of painites #6 and #7 was relayed to geologists in Myanmar in 2004. Efforts were soon underway to find more in the northern province. Those efforts were successful. 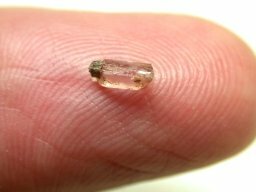 The Associated Press/Rangoon reported on March 15, 2005 that two crystals were found near Phakant, Kachin State, Myanmar, by geology student Kyaw Khaing Win. Phakant is near Namya where painites #6 and #7 were obtained. The Myanmar Times reports the discovery of the same two stones in the Namyar region but puts the data of discovery as November, 2004. 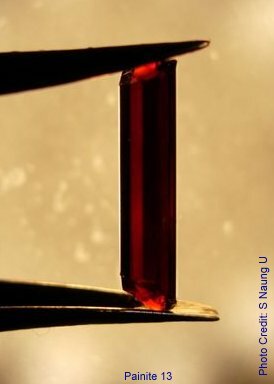 A picture from the Yagon City website, repeating the Myanmar Times article, shows the painite #15 crystal. 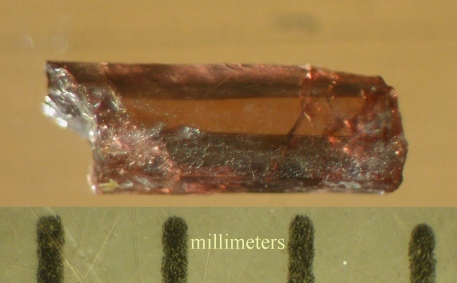 Painite #14 is a pale pink, 0.0727 gram, transparent, dichroic gemmy crystal identified in late 2004. The outline of the crystal shape of crystal 14 is apparent looking down the long axis of the crystal. Its identity was positively confirmed at Caltech in early 2005 and it is currently under private ownership in the United States. 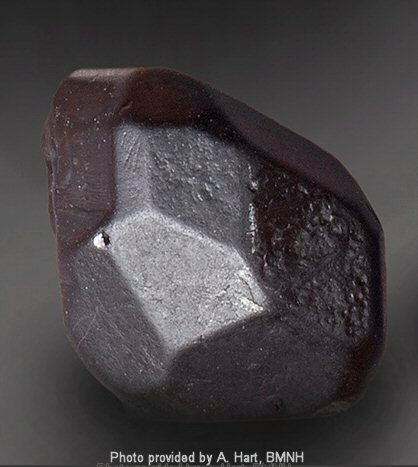 Painite #15 is a 0.0662 gram, medium red-brown, dichroic crystal, transparent crystal identified in late 2004 or early 2005. The outline of the crystal shape of crystal 15 is apparent looking down the long axis of the crystal. Its identity was positively confirmed at Caltech in early 2005 and it is currently under private ownership in the United States. 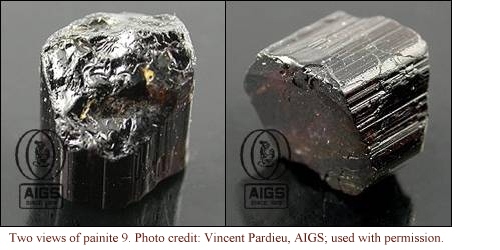 Four additional painites were positively identified by a gemologist at the AIGS laboratory in Thailand. Additional information about them was available on the AIGS website (broken link, 2014) . 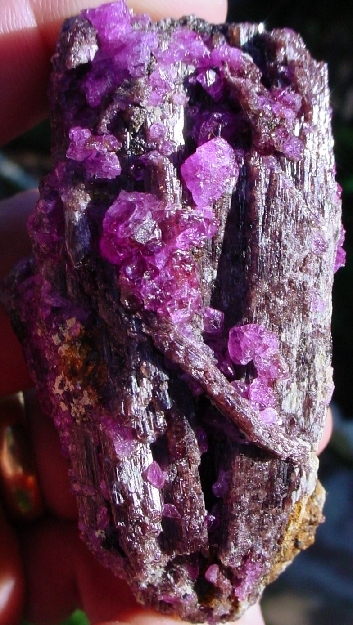 These crystals are believed to have been discovered in late 2004 to early 2005. 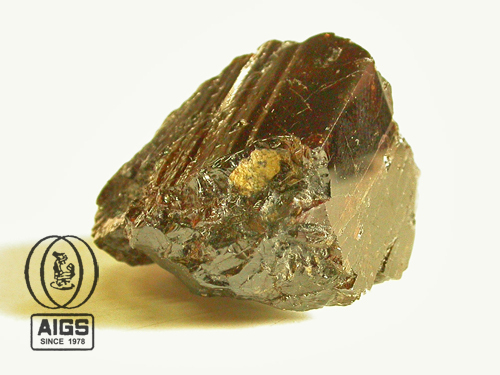 Painite #17 is a crystal that was found the Mogok region. Painite #18 is a small gemstone faceted from a painite found in Northern Myanmar. 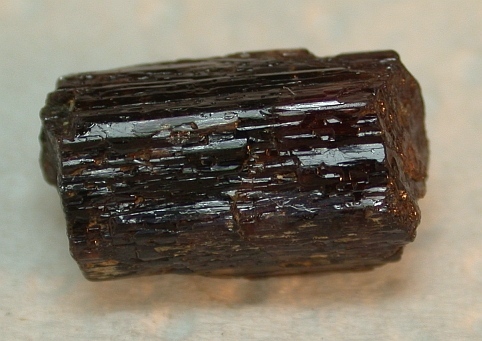 This is the second reported faceted painite. 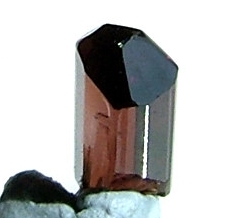 (See painite #5, also a faceted stone). Three more painites were discovered in early 2005 in Burma. 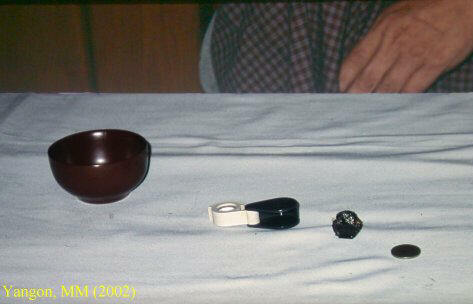 The properties of these there stones are characteristic of the crystals that come from the Namya locality. 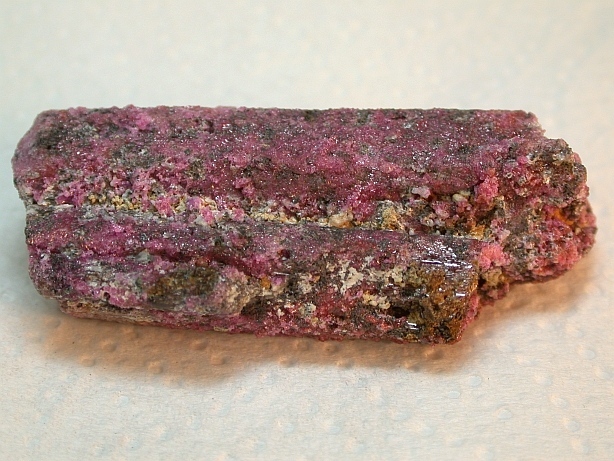 Painite #20 is a 0.0280 gram (0.0140 ct) pale purplish pink, dichroic crystal fragment devoid of a termination. 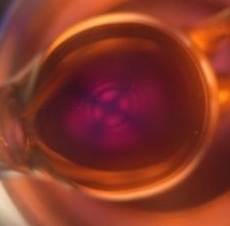 Looking down the c-axis, the hexagonal shape of the crystal can be seen. 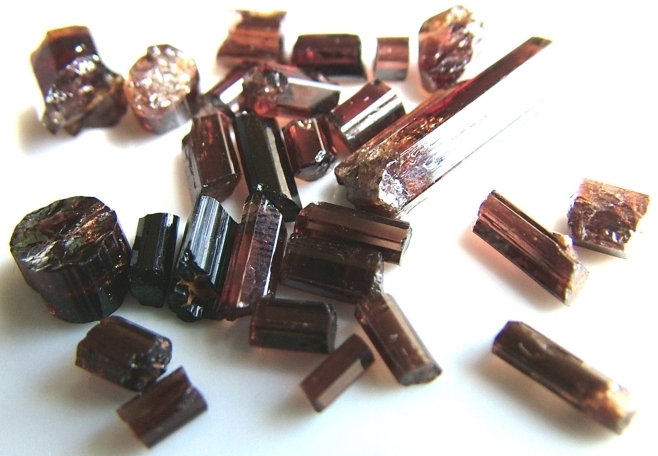 There are also inclusions in the crystal that contain brown and red phases within and around the longer, tubular inclusions. 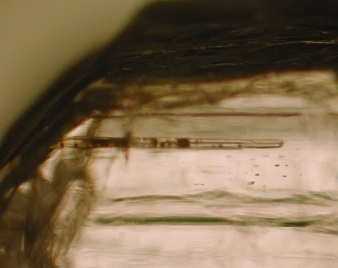 This crystal is under private ownership and has been studied at Caltech. 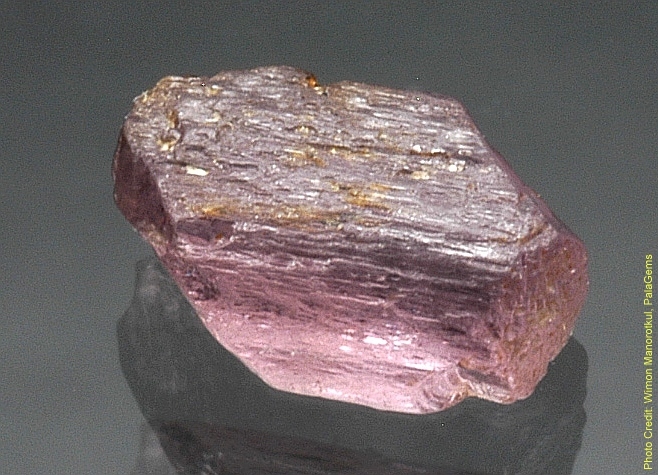 Painite #21 is a 0.0335 gram (0.1675 ct) grayish purplish pink, dichroic crystal fragment with comparatively fresh prism faces, but devoid of terminations. Looking down the c-axis, the hexagonal shape of the crystal can be seen. 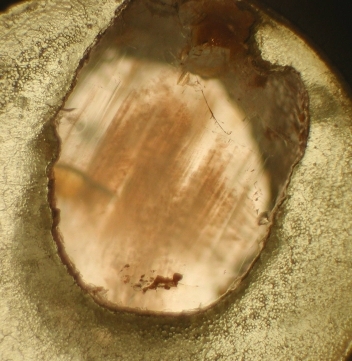 There are also inclusions in the crystal that contain brown and yellow phases within and around the longer, tubular inclusions. 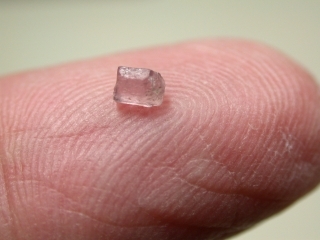 This crystal is currently under private ownership and has been studied at Caltech. Painite #22 is a 0.0321 gram (0.1605 ct) pale purplish pink, dichroic, clear crystal fragment that is devoid of terminations. 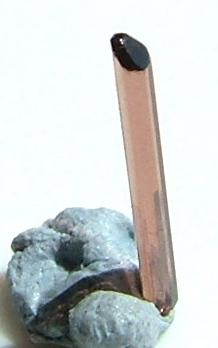 Looking down the c-axis, the hexagonal shape of the crystal can be seen. 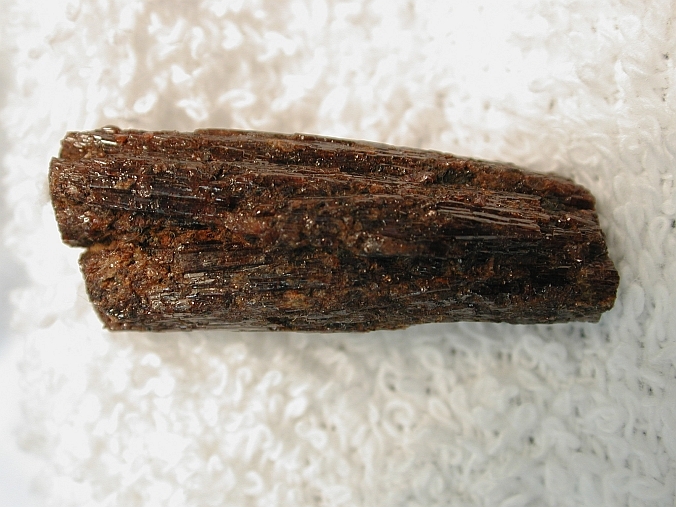 The surface of this crystal has a tree-bark texture that some of the other crystals from northern Burma have. 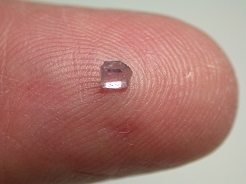 This crystal is privately owned and has been studied at Caltech. Much additional information about the first 22 painites was reported in May 2005 at the Goldschmidt 2005 Conference in a session (Page A278) on the gem minerals (Rossman et al., 2005). The authors concluded that the mineral forms in a skarn deposit. 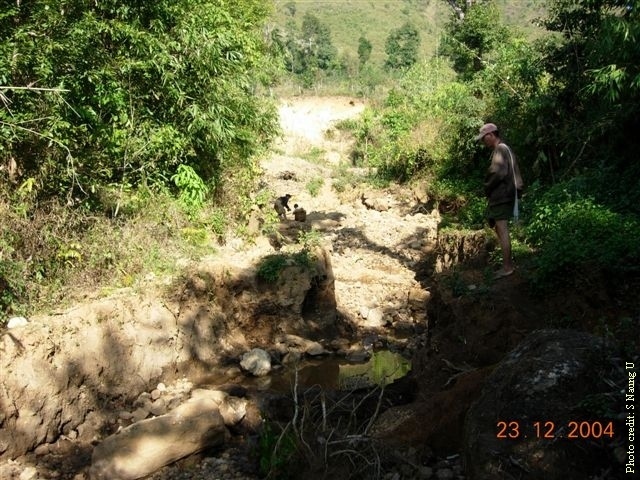 After submission of the abstract, but before it was presented at the meeting, the skarn deposit where painite formed was located in Myanmar as reported below. 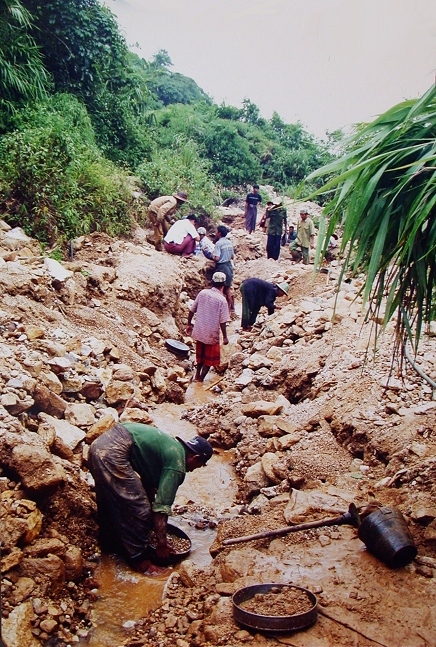 December, 2004: The initial source of painite has been claimed by local residents to be alluvial pebbles obtained near Ohngaing Village in Myanmar. These painites showed only modest water rounding indicating that the primary source was nearby. The actual source of painite near Ongaing Village has finally been located. 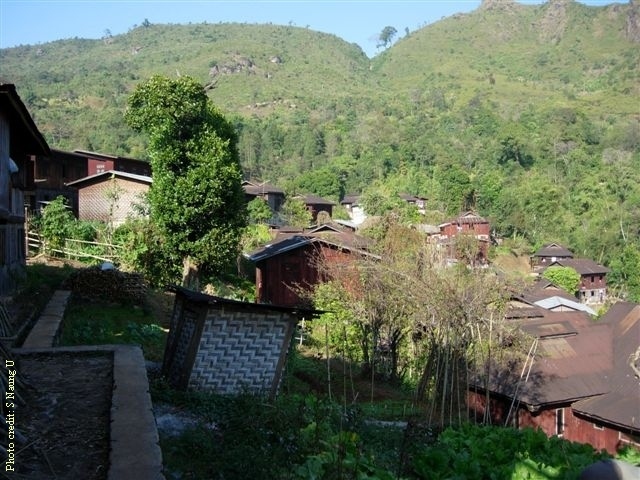 Ohngaing Village is slightly more than a mile NNW of Mogok. 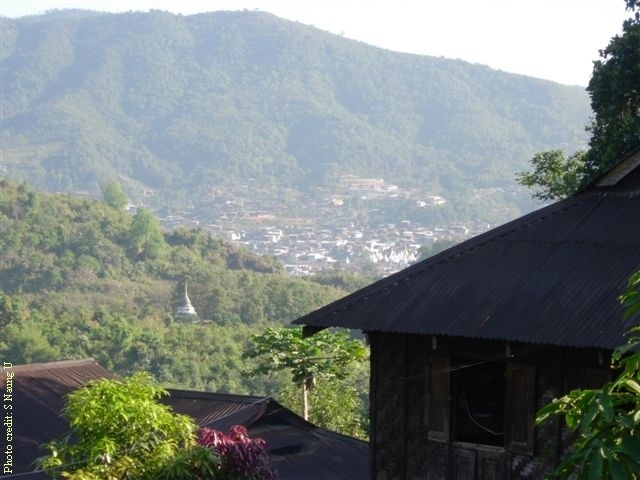 From Ohngaing Village one can see Mogok in the distant valley in this picture. 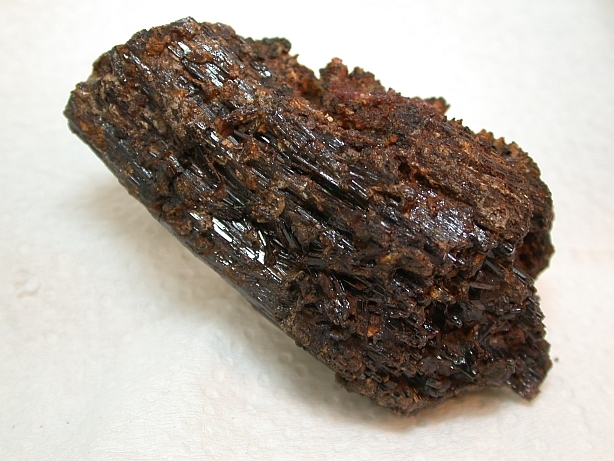 Painite was reported to found at a small mine just at the edge of Ohngaing known as the Sinhalite Mine. 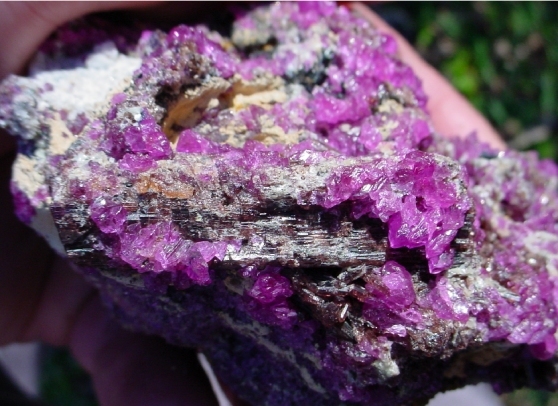 The mine produces mostly spinels of assorted colors, tourmaline and sinhalite. The mine doesn't produce any gem-quality corundum. 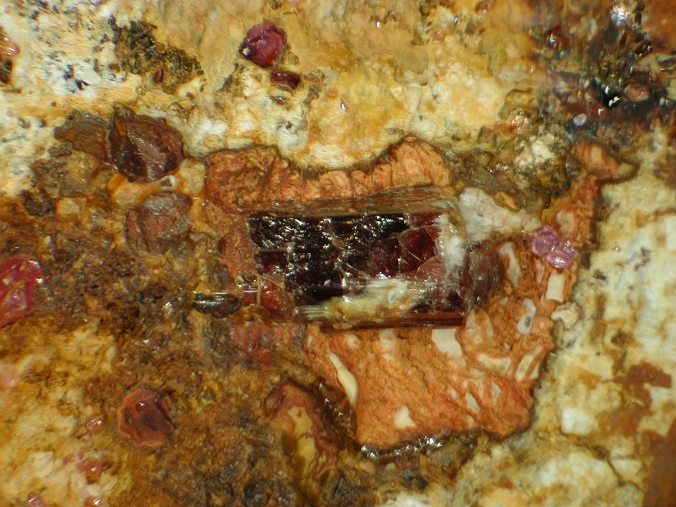 Painite is said to be found in the upper portion of the mine near the contact of leucogranite and marble in weathered soil. 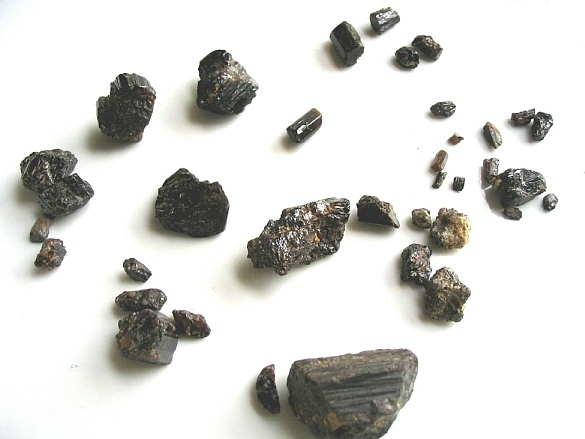 Subsequent exploration of the geological formation has greatly expanded the region where painite is found as indicated in the paragraphs below. Painite #23 is a 4.8 mm long, 0.9 mm wide intergrowth of two crystals (estimated weight, 0.03 grams) in a matrix of rubies, rutile, and fine-grained clay minerals including anatase and iron oxide. 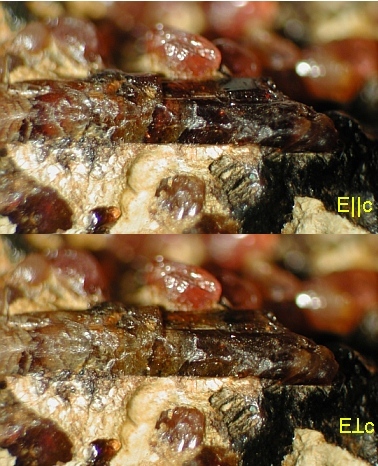 It is weakly dichroic from reddish-brown to yellow-brown but the dichroism is hard to see because of darker inclusions in cracks in the specimen. It was reported in late May, 2005. It's identity was confirmed from its Raman spectrum. It is currently under private ownership and has been at Caltech for confirmation of the identification, but was not removed from the host matrix. 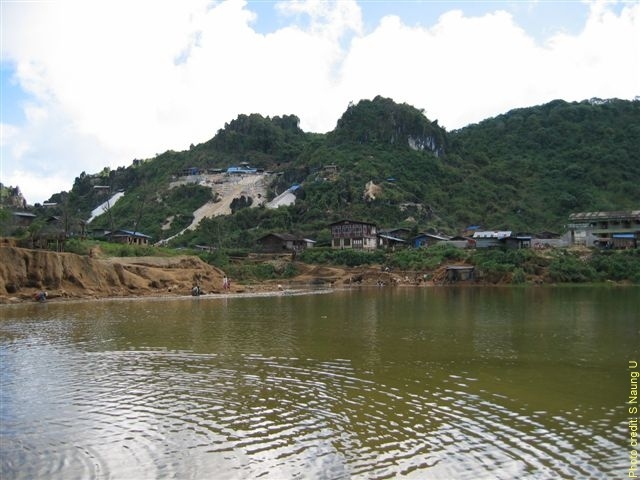 Its color and properties indicate that it originated in the deposits in the Mogok district. 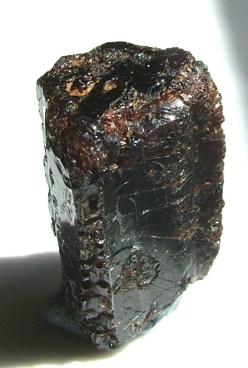 Painite #24 is also a crystal on matrix that was shown in Yangon in May, 2005. No further details are available at this time. 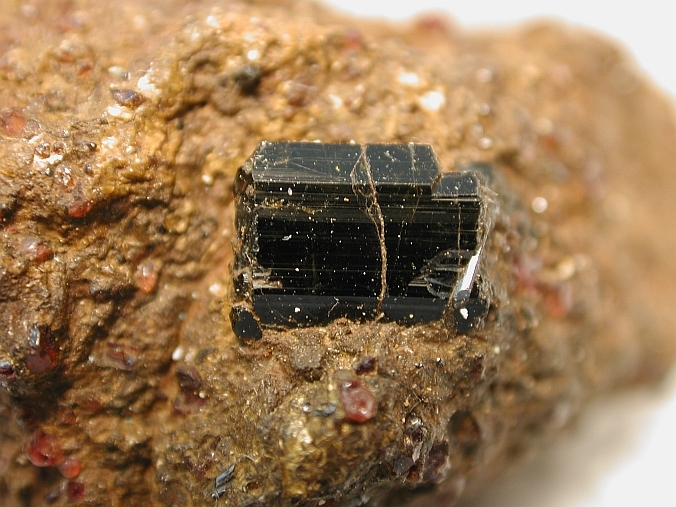 Painite 25 is an approximately 2 cm long crystal in a matrix of a skarn rock containing ruby and biotite. 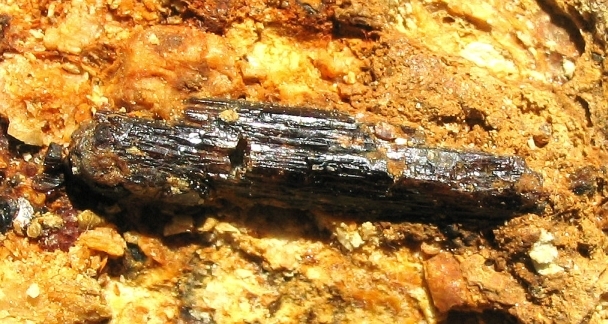 The crystal has a dark color typical of crystals discovered so far in the Mogok region. 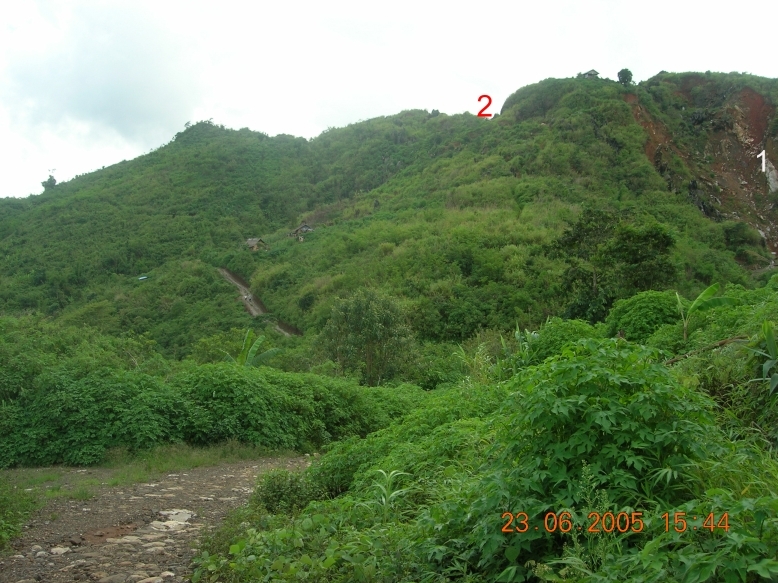 The locality is west of Mogok, near Kyaukpyatthat (Kyauk Pyar Thart). They are found at the Wetloo quarter near the base of Hinthar Hill where they form at the contact zone of leocogranite and marble. Once the actual source was known, an extensive effort was made to find more painites from the Mogok deposits. These efforts were comparatively successful resulting in a plentiful supply, at least compared to early 2005. 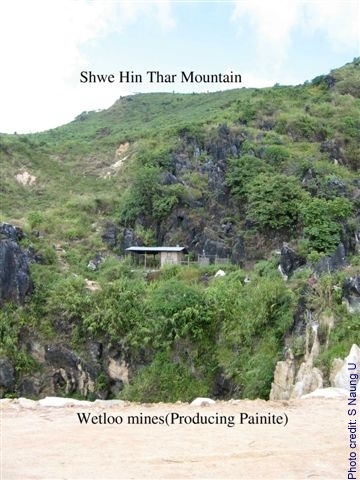 The Wetloo Mine on Hinthar Hill; painite occurs at the contact zone near the base of the hill. A note to the readers of this page. 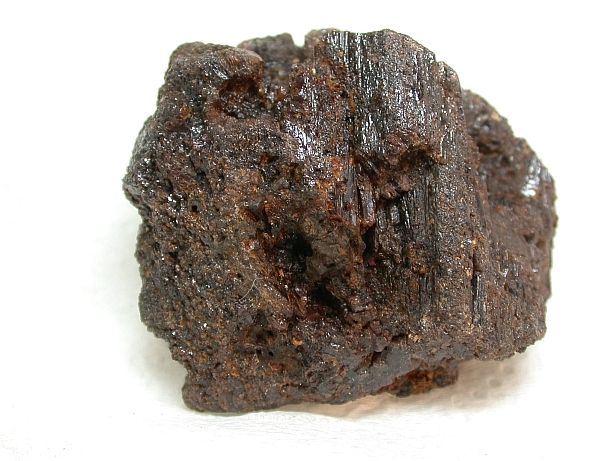 With the new discoveries, painite became more abundant, Further numbering of specimens beyond number 25 was not justified and was discontinued at this web site. Pictures of new specimens will continue to be posted when they are of particular merit, crystal perfection or beauty, or if they have been the object of detailed scientific investigation. 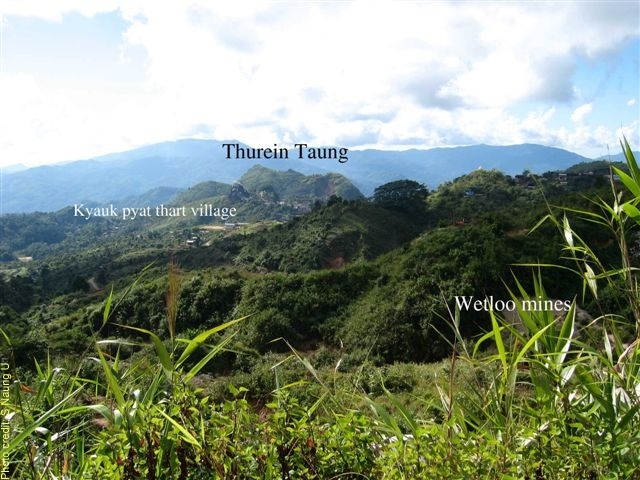 Within one week of the discovery of painite at Wetloo, Painite was found east of Mogok very close to Thurein-taung (painite locality = number 1 in photo; village = number 2) at Ah Sein Taw Quarter. 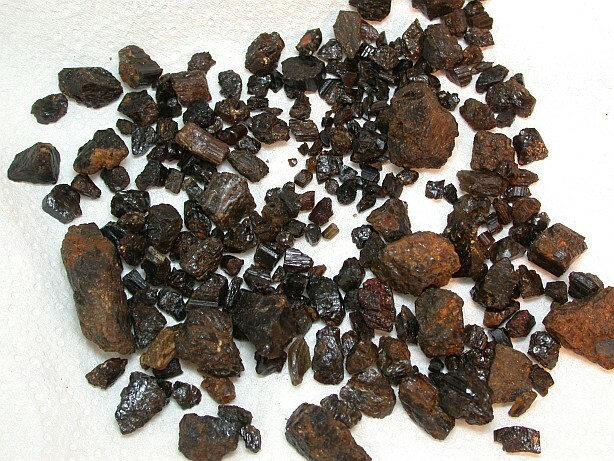 Many fragments and crystals of painite have been found there. Nearly every home there had painite for sale. 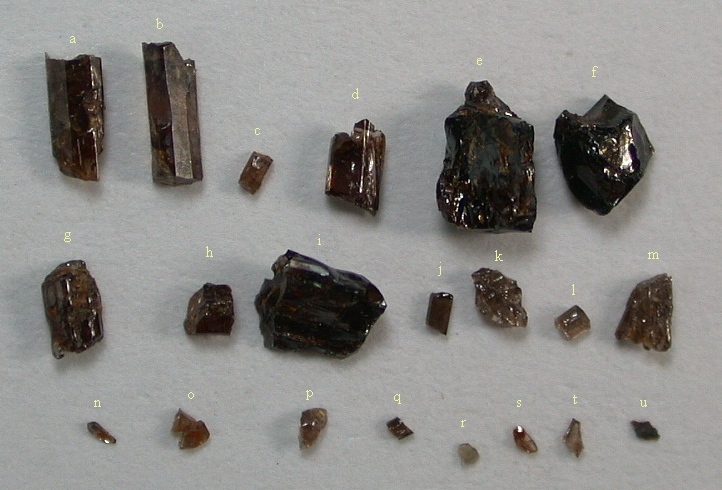 Most are mineral specimen quality. Some can be cut to a cabochon and only a few are suitable for faceting. 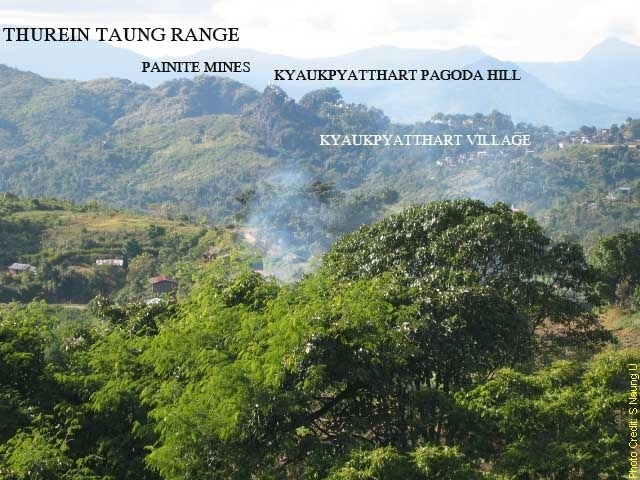 This locality is also known as Thu-Rein-Thaung and as Sun Mountain. Numerous painites were available in the local gem and mineral markets. 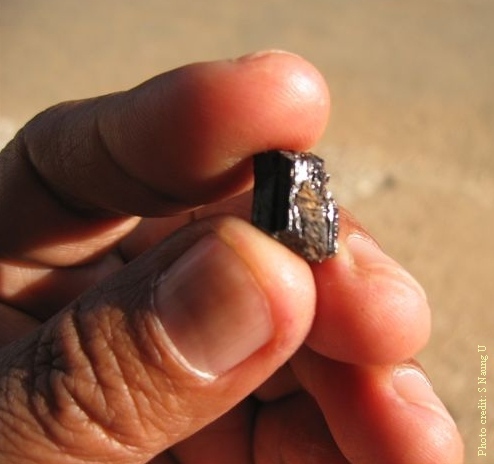 Smaller, secondary deposits have also been located in the area that further increase the supply of painite. 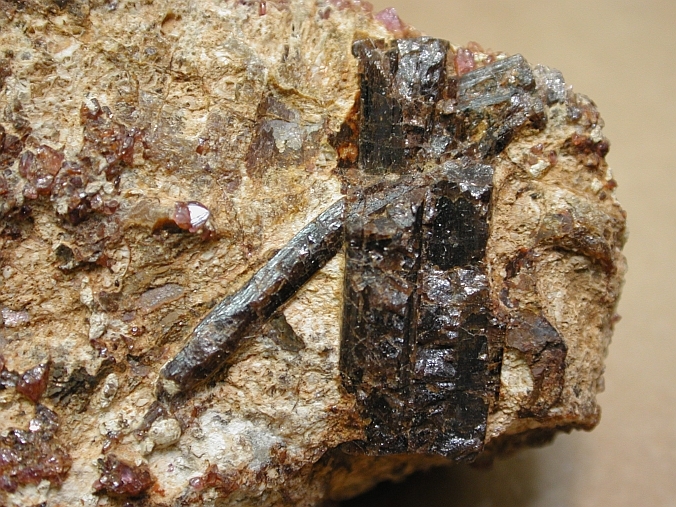 Numerous fragments of painite crystals have been discovered as a result of extensive efforts to sluice the entire area where painite occurs. Most of these were sent to Thailand for processing and sale. Most of them were purchased by the company, Pala International. Most of them came from the Wetloo Mine and others came from the Thurein-taung locality. 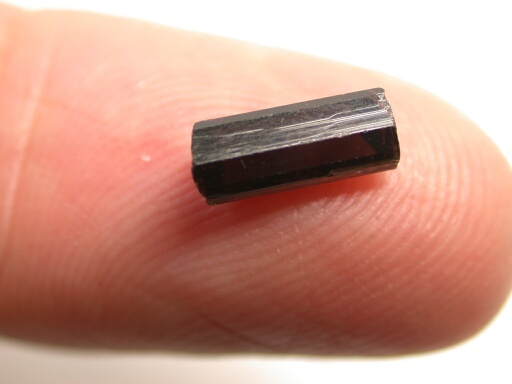 A few incomplete, dark crystals exceeding several hundred carats have been found. 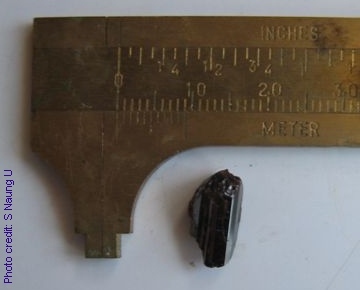 d) A 96 gram specimen of a crystal with smaller crystals attached. Fine specimens exist, but are rare. 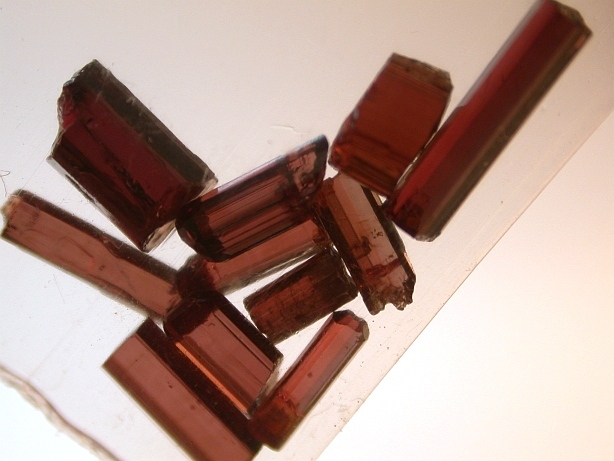 While many pieces have been cut into dark red cabochons, facet quality material is said to remain almost unattainable. 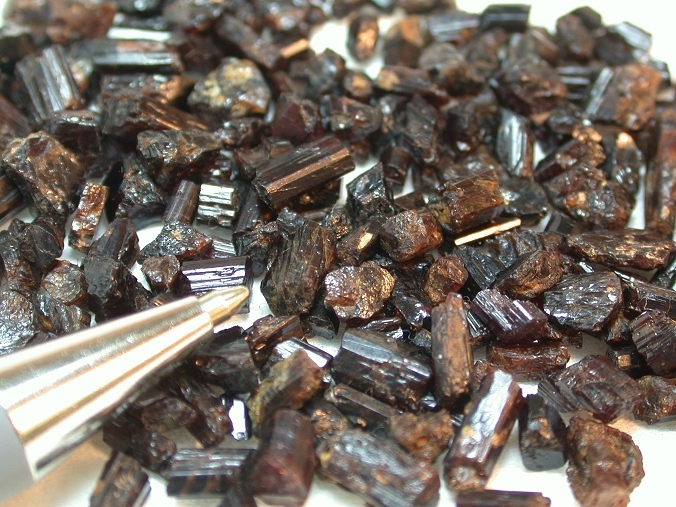 Matrix specimens with abundant painite fragments have also been obtained. 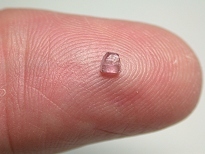 A number of small faceted stones have been prepared from the recently discovered highest quality stones. 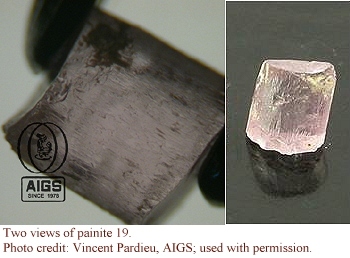 A picture of the three largest new faceted stones, and more history about the recent stones is available on the website of Palagems. 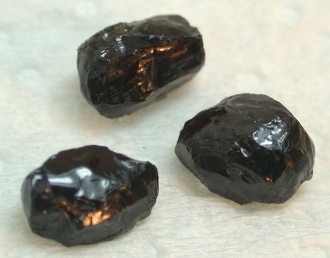 As of the second week of October, 2005, specimens of painite and faceted stones have been available for sale on the internet at several sites. A number of crystals and faceted stones have been obtained by major museums and are expected to soon be on public display. 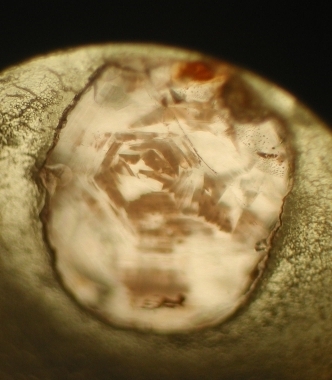 The Los Angeles County Museum of Natural History has a 4.9 mm (0.47 ct) faceted stone. 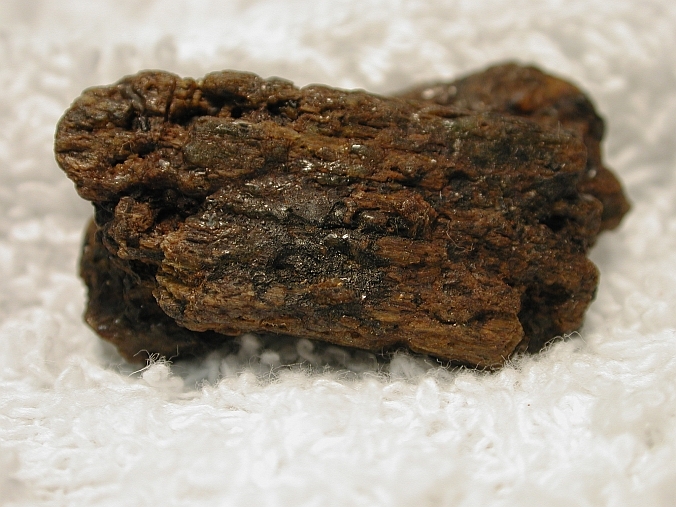 Both the National Museum of Natural History - Smithsonian Institution, and the American Museum of Natural History have also obtained examples of painite. About 700 crystals and two faceted stones were brought to the Asian Institute of Geomological Sciences in Bangkok by a Burmese dealer. Details were posted on the AIGS website. 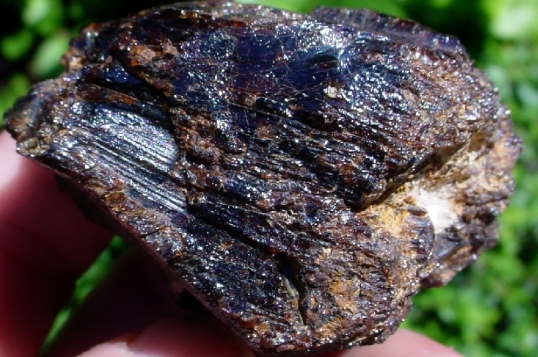 Painite is now found in the Bawlonegyi area due west of Mogok. 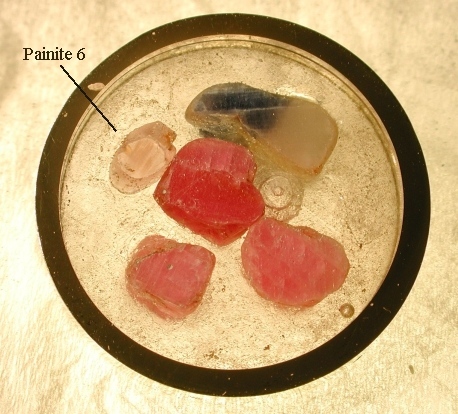 The crystals are small in size and have a color similar to the painites from the Wetloo mine with six sided crystals. They have been found only in secondary deposits, to date. 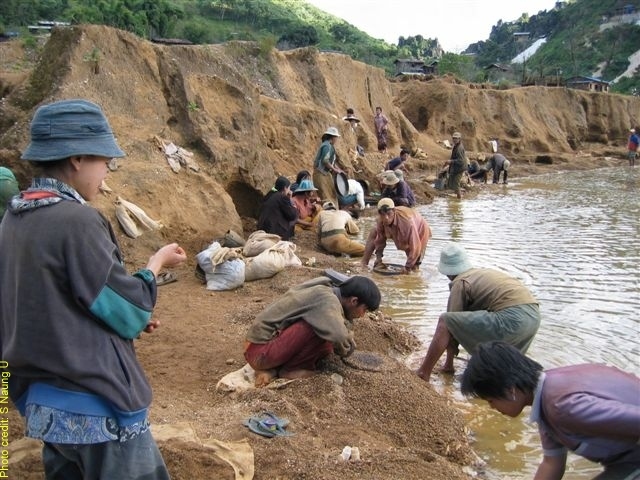 Here are pictures taken in mid December 2005 of Bawlonegyi Palaung Village and a miner panning for painite. 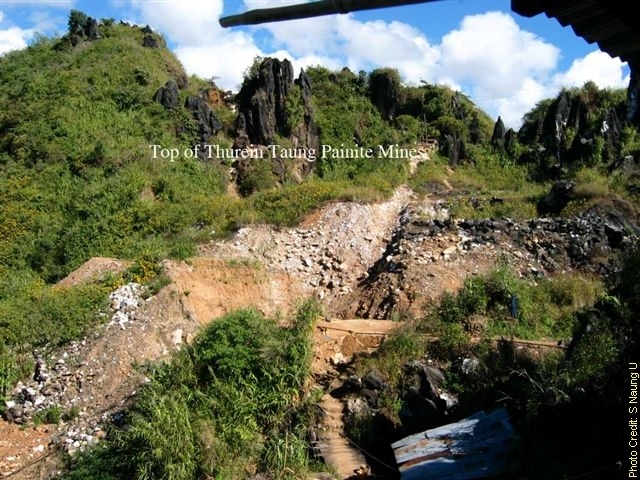 Here are pictures of the Thurein Taung painite mine and Thurein Taung vicinity as they existed in mid December. 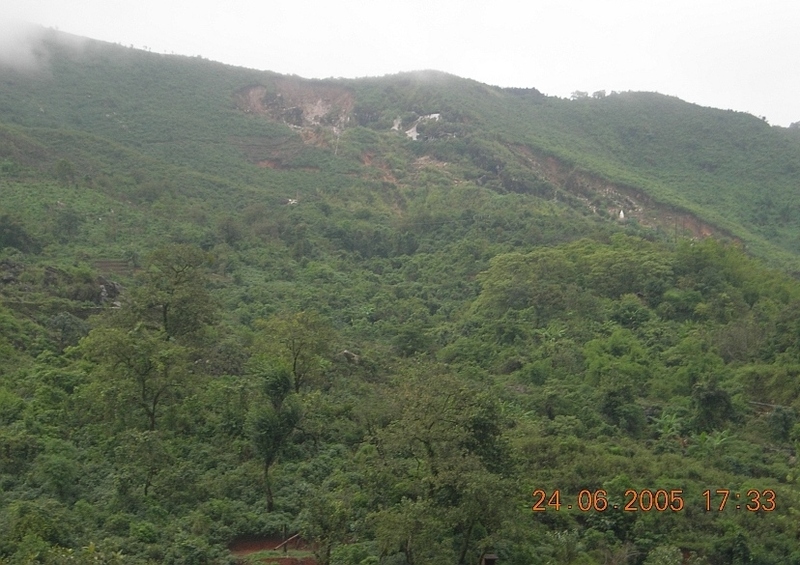 And here is a view of the mine in spring 2006. Here are pictures of painite from the Wetloo painite Mines, a different view of the workings, and the local area. 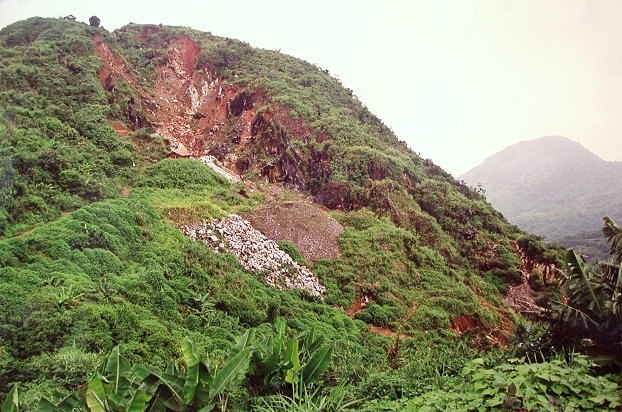 Here is the mine in spring 2006. 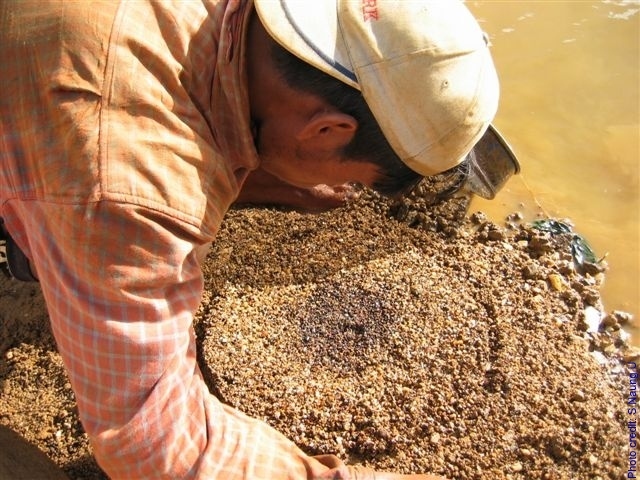 Painite has been reported from both Kin and Kabaing, two villages west of the other Mogok region localities. Painites were for sale at the Tucson Mineral show. 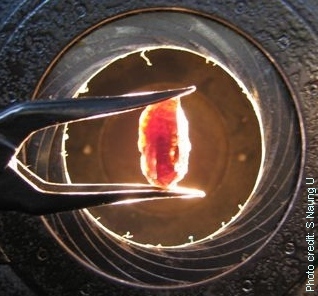 The GemResearch Swiss Lab reports the discovery of the largest painite specimen to date weighing 633 grams (3,165 cts). 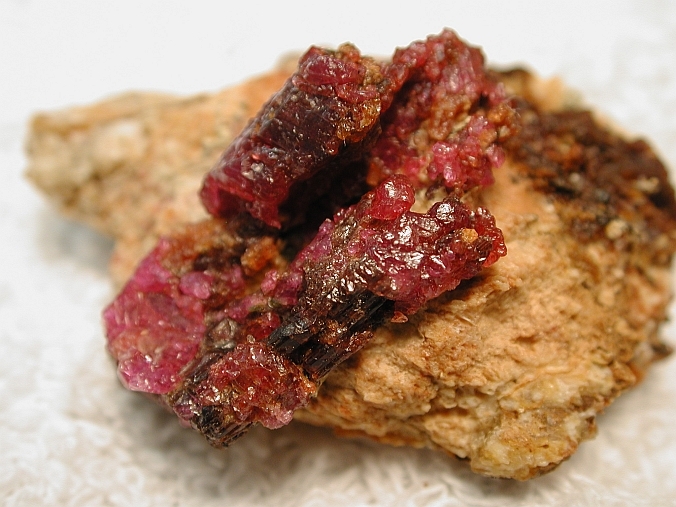 Found in mine tailings, it is a large, lusterous painite crystal overgrown with numerous rubies. 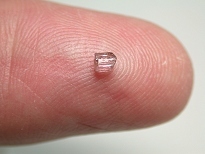 A 5 mm crystal in matrix. 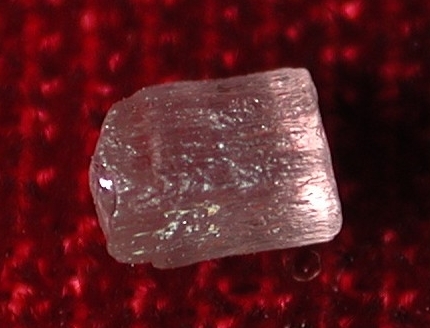 Another crystal in matrix with spinels. 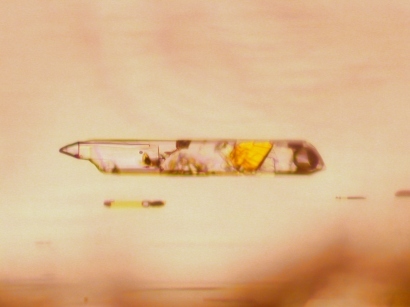 A 1 cm crystal in matrix with excellent crystal faces. 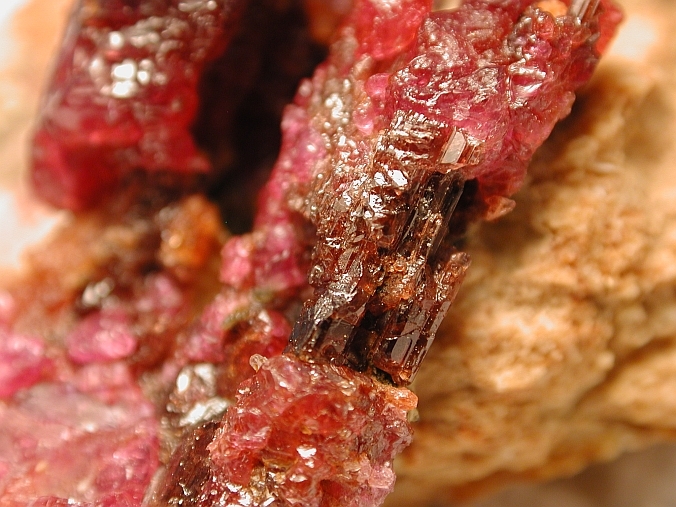 A 4.5 cm crystal of painite mostly replaced by ruby; a closeup of a painite region. 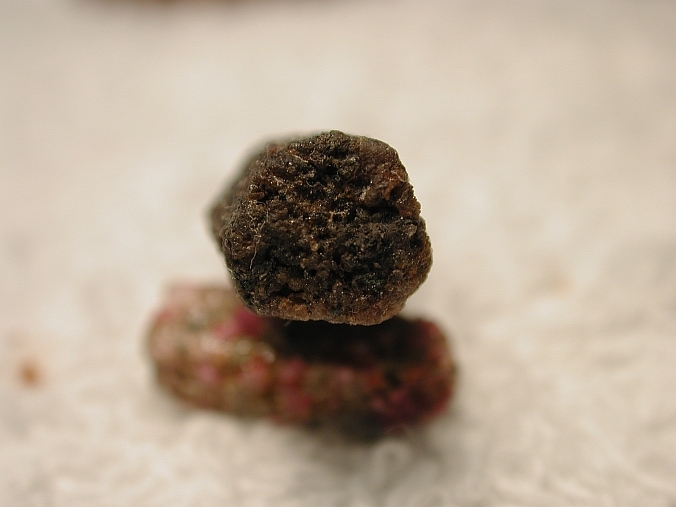 Additional pictures: a lusterous 26.3 gram painite with prominent red spinel. 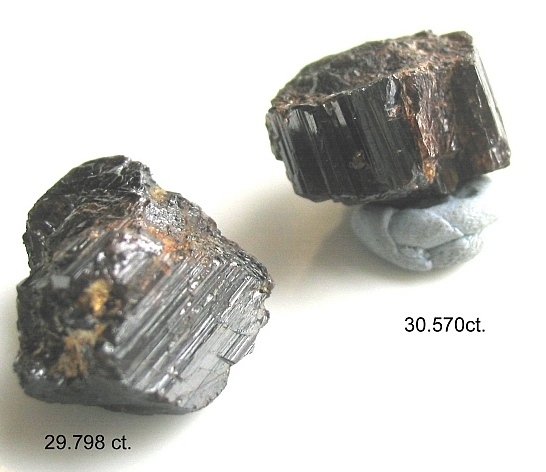 A 4.5 cm crystal and a 4.4 cm crystal pair. 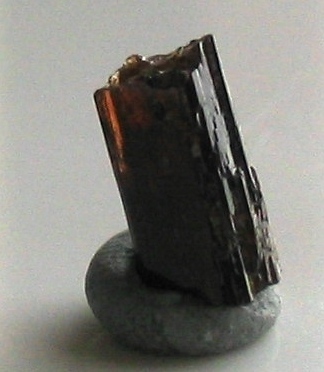 A painite crystal with hexagonal shape. 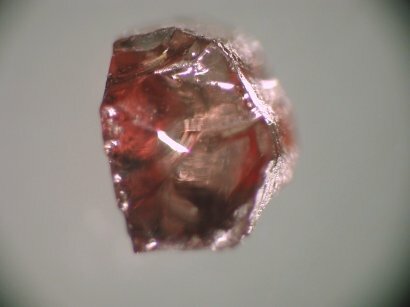 A 0.52 carat pink crystal of painite from Namya was obtained by Pala International. 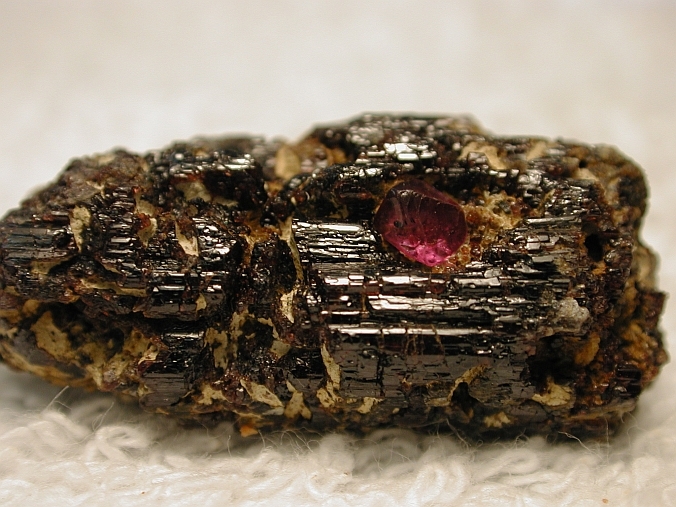 An approximately 100 gram painite crystal, a 180 gram painite with ruby specimen and a 456 gram cluster of ruby encrusting painite crystals that, in turn, are on a base of ruby. These specimens were shown by Will Heierman (www.corunduminium.com/asia.htm) who provided the pictures. 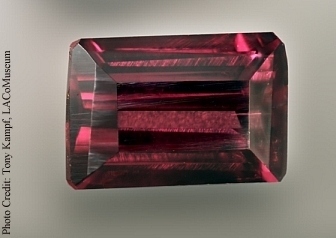 A 3.8 carat, dark red painite was obtained by Pala International. Armbruster T, Döbelin N, Peretti A, Günther D, Reusser E, Grobéty B (2004) The crystal structure of painite CaZrB[Al9O18] revisited. American Mineralogist 89, 610-613. Claringbull GF, Hey MH, Payne CJ (1957) Painite, a new mineral from Mogok, Burma. Mineralogical Magazine 31, 420-5. Hart A, Rumsey M (2014) A wonderfully 'painful' discovery. The Journal of Gemmology 34, 10-11. 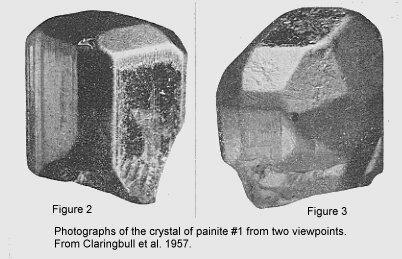 Povarennykh AS, Clark AM, Jones GC (1978) The infrared spectrum of painite. Mineralogical Magazine 42, 518-19. Rossman GR, Naung S, Harlow GE, Hunt J (2005) Painite (CaZrBAl9O18): A second source in Myanmar and metasomatic origins. Abstract. Goldschmidt Conference 2005, Moscow, ID. Geochimica et Cosmochimica Acta 69, A278. Shigley JE, Kampf AR, Rossman GR (1986) New data on painite. Mineralogical Magazine 50, 267-70.